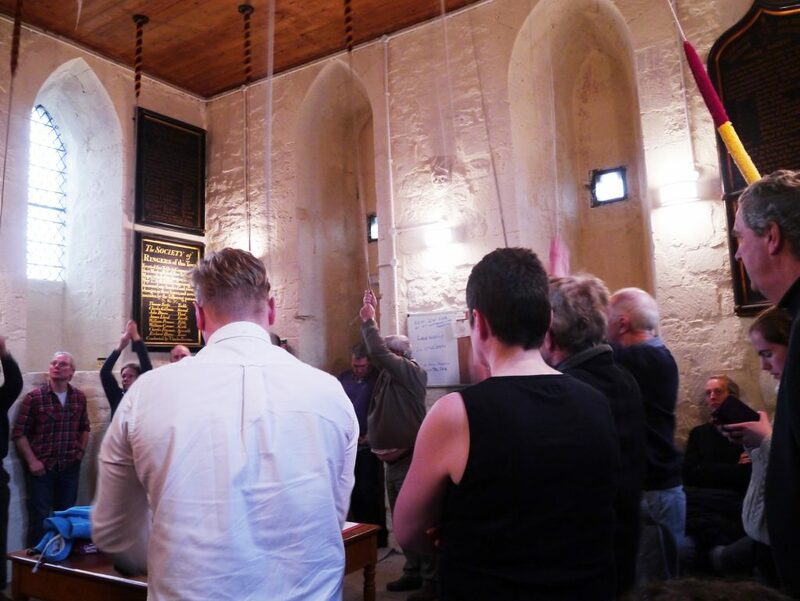 As a relative newbie to the bewildering world of bell ringing I was asked to write something about our winter outing to 4 churches in the Cheltenham area – all in urban settings and, for me, each one a challenge! 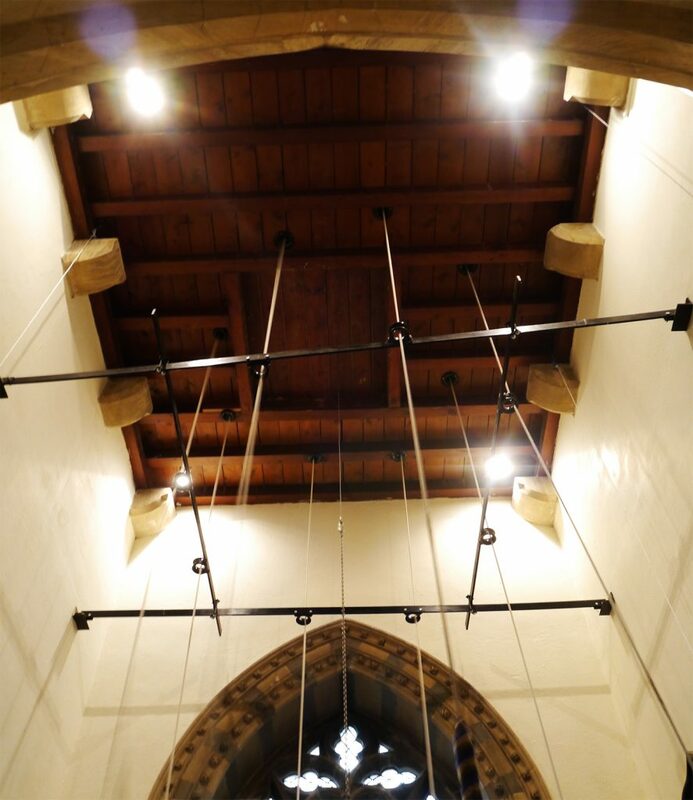 Our itinerary listed the weights of the bells in each tower – just one more thing to get to grips with – but even I thought the second lot of weights looked odd – (0 – 2 – 7). But no, it was right. 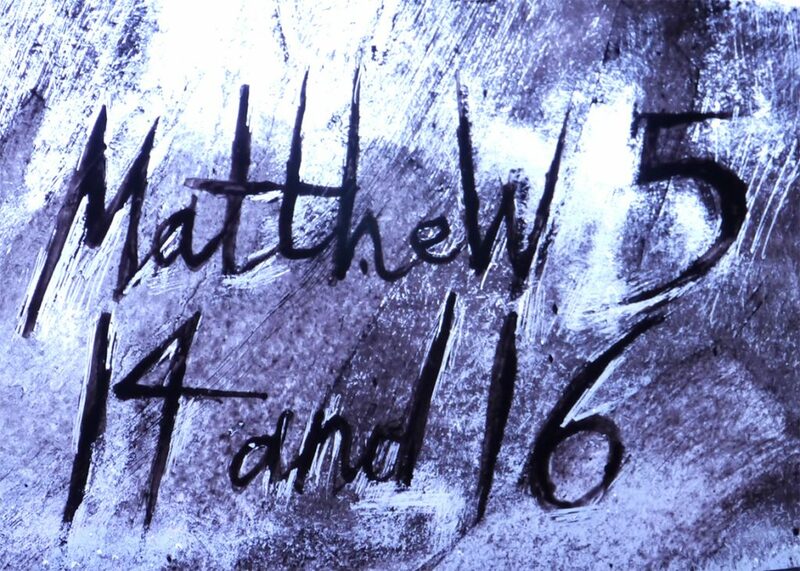 Anyway, let’s start at the beginning. 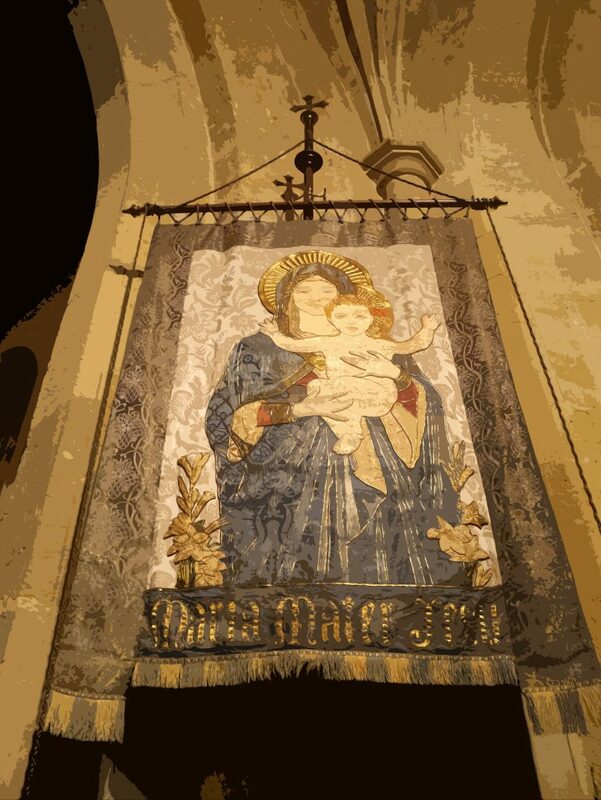 First stop – Cheltenham Minster Church of St. Mary in the middle of town with 12 bells. The technique it seems would involve holding your bell up, pausing and then pulling on that rope to keep in time with the rest – in other words, ring slower. 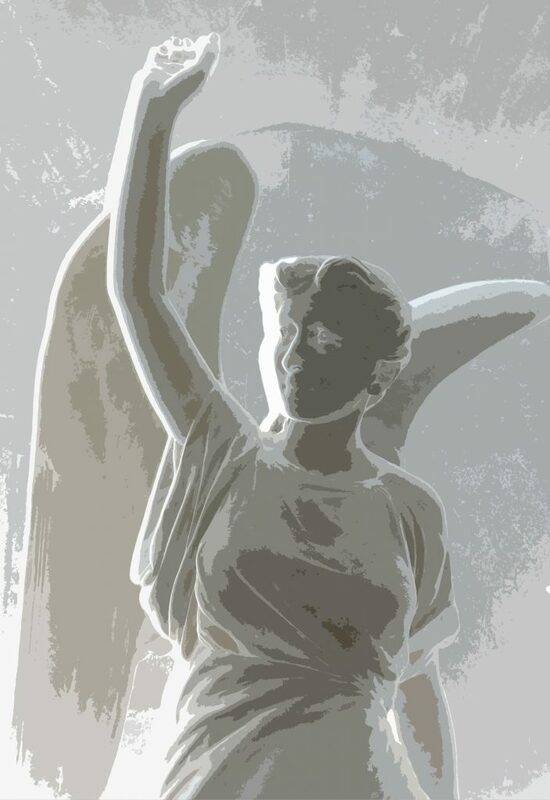 I’ve got the theory – I just can’t put it into practice at will – yet! 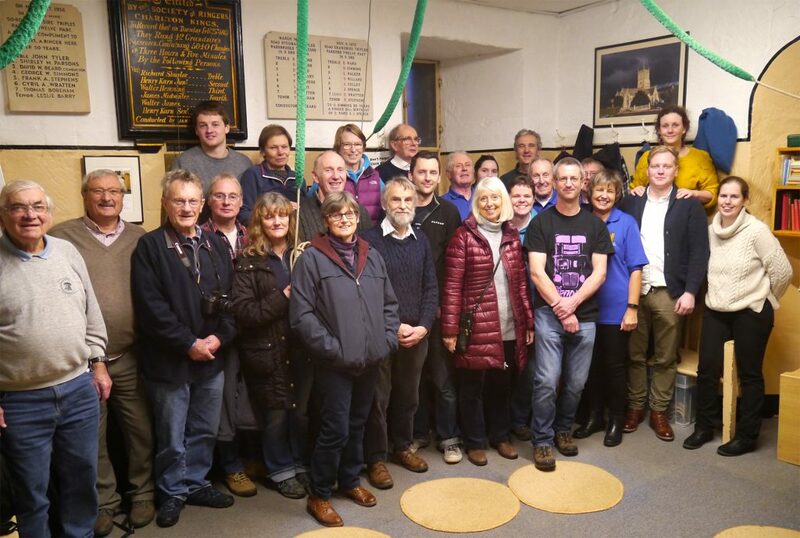 Hearing those who can is a great experience – there were a lot of ringers present – 30 or thereabouts, some from Holmer, Hereford, and some from Bodicote, Banbury, all at different stages of their development – so all levels of ability. 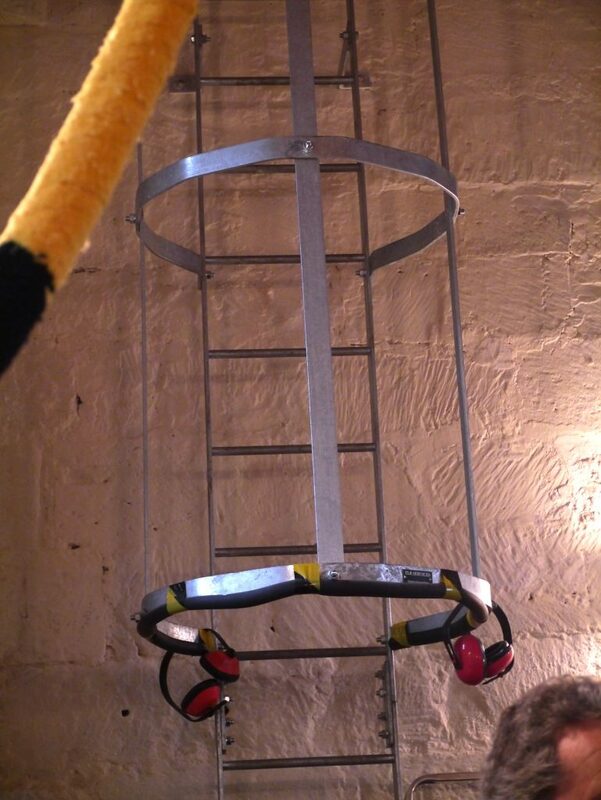 Good to see the guard around the ladder leading up to the bell chamber – and those ear defenders – eh? what? So on to Stop 2 – St. Christopher’s at Warden Hill, a little church masquerading as a house, built in the 1960s in the middle of a 1950s housing estate. So, as I mention above, our itinerary told us that the weight of these bells is (0-2-7) – in layman’s terms zero hundredweight, 2 quarters (that’s 56 lbs or 4 stone) and 7 lbs. The metric system is so much easier!! 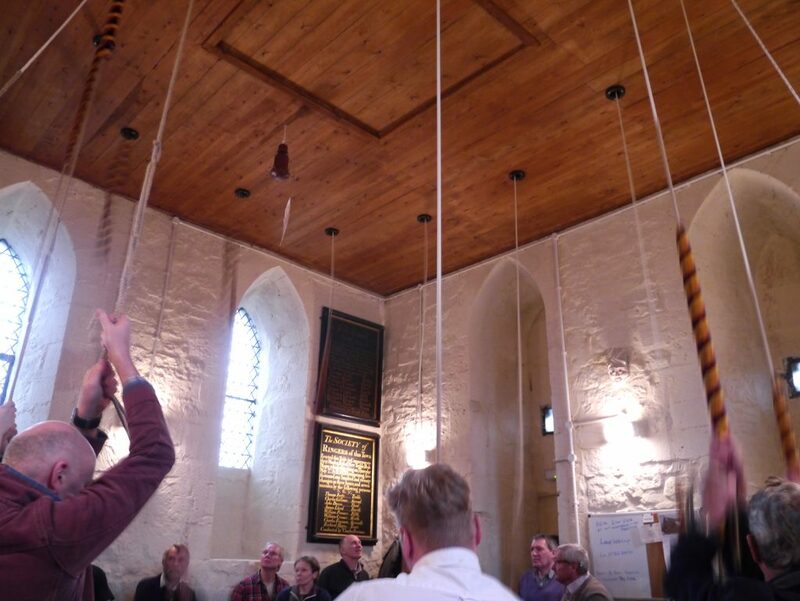 Anyway, given that the weights for the third tower were (16-1-2), you can see that this second ring of 6 bells were going to be tiny – and so they proved! The look of bemusement, bewilderment and general puzzlement is evident on the faces of the ringers in the next couple of photos. 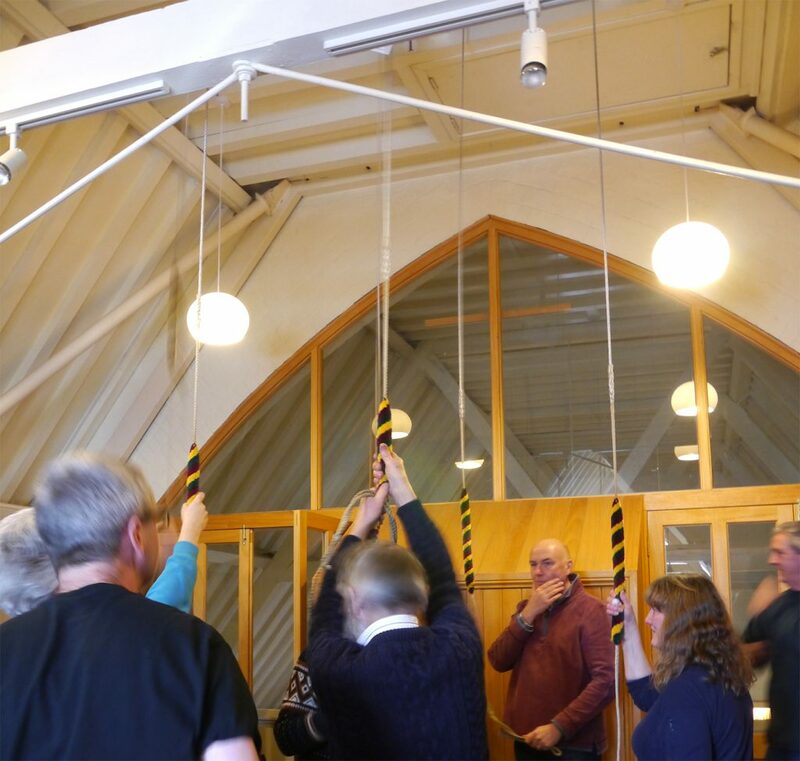 To ring these bells successfully meant using only one hand on each stroke to avoid using too much force and break the stays – the action of the ringers, with alternate arms swinging rhythmically to gingerly grab the rope, reminded me of sailors climbing the rigging of a ship. 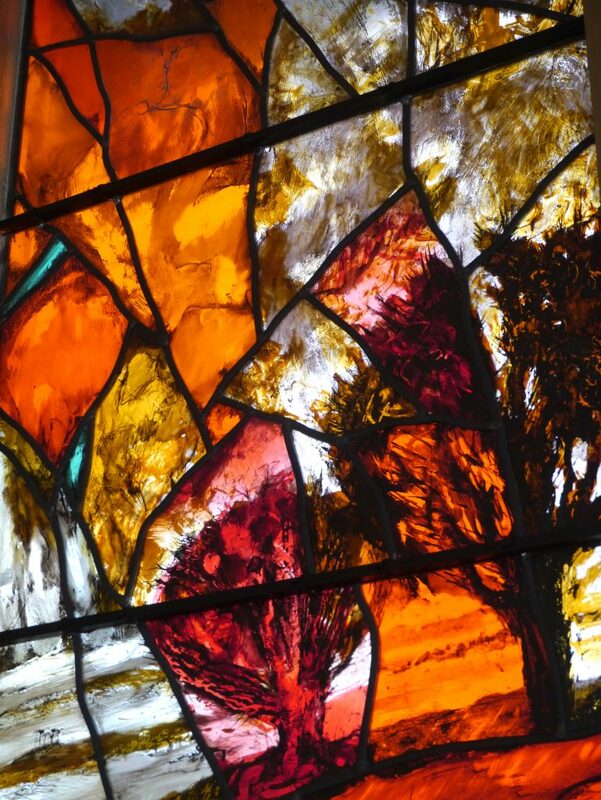 I decided I would be better off going downstairs to admire the stained glass. 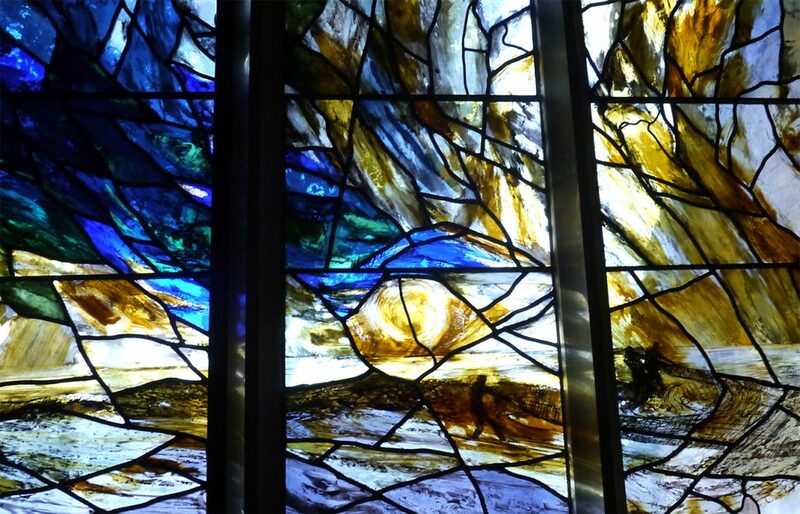 There were 10 triptych panels altogether along both sides of the nave, created by artist Tom Denny, who is also responsible for the beautiful Traherne window in Hereford Cathedral. 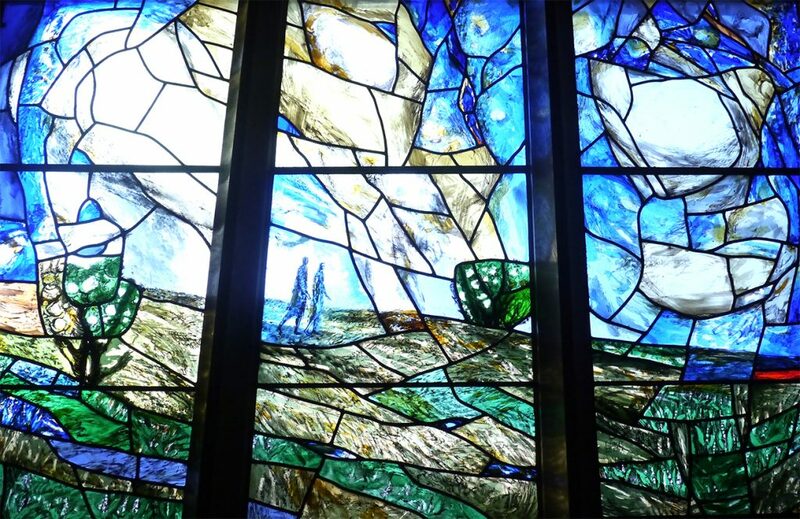 Here at Warden Hill, the panels depict Jesus’s parables from the Bible with a reference to the book and chapter they are taken from. 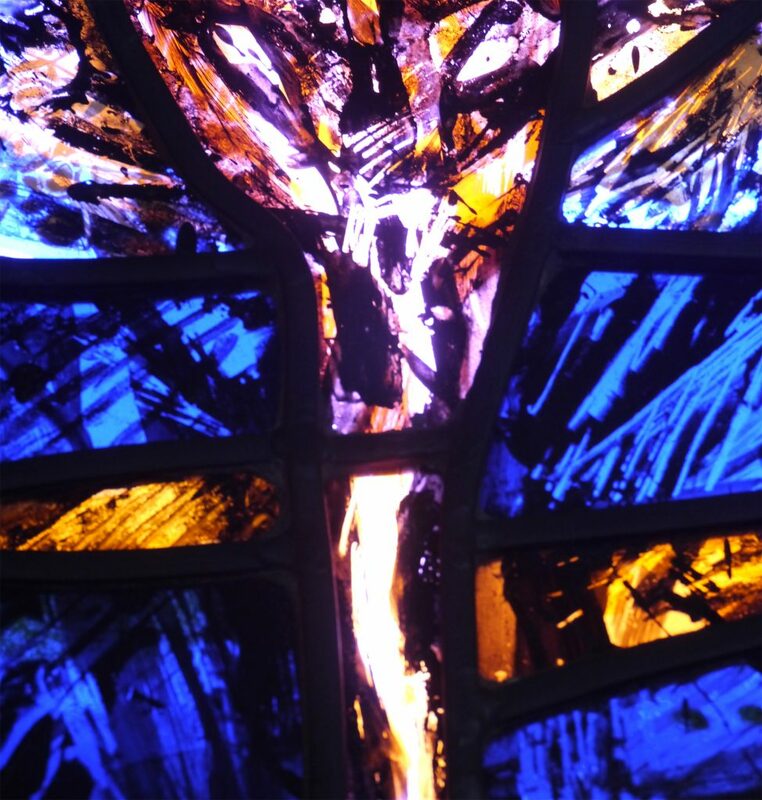 We stopped for lunch, which was a welcome break, and then resumed our ringing at St.Mark’s. 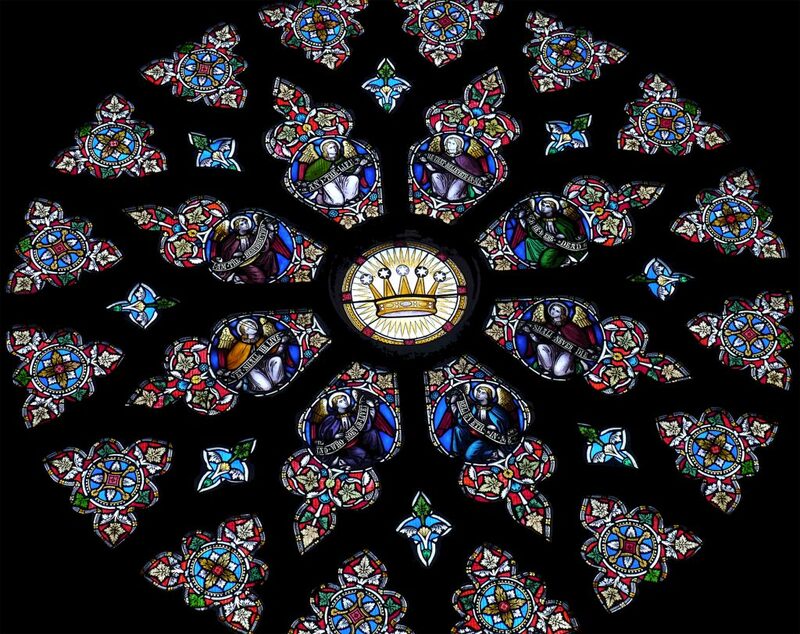 Unfortunately, the church itself was closed. 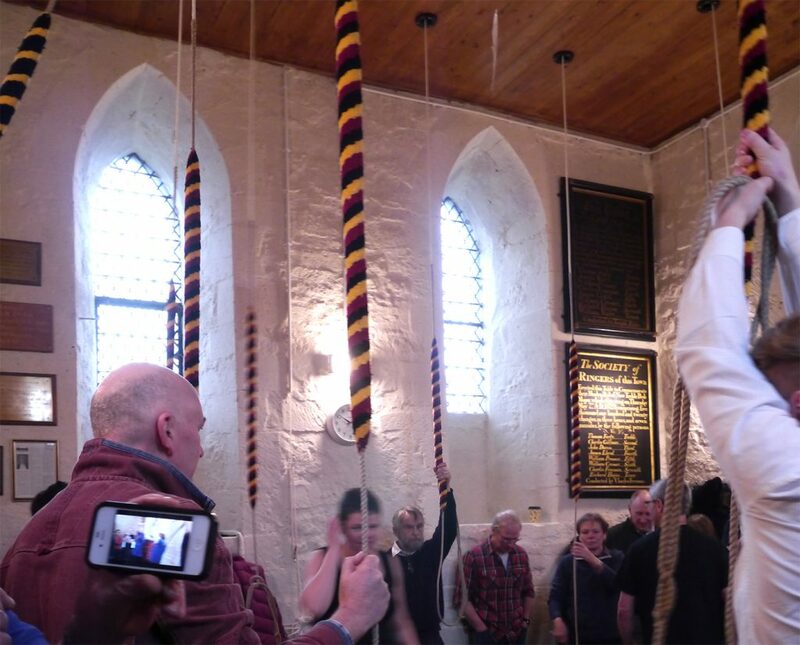 The set up in this tower was more like Withington, where the Holmer ringers regularly ring: so 8 bells with a longer draught – the rope is (and feels!) a lot longer. What they had here, which Withington doesn’t have, is a metal frame to guide the ropes. 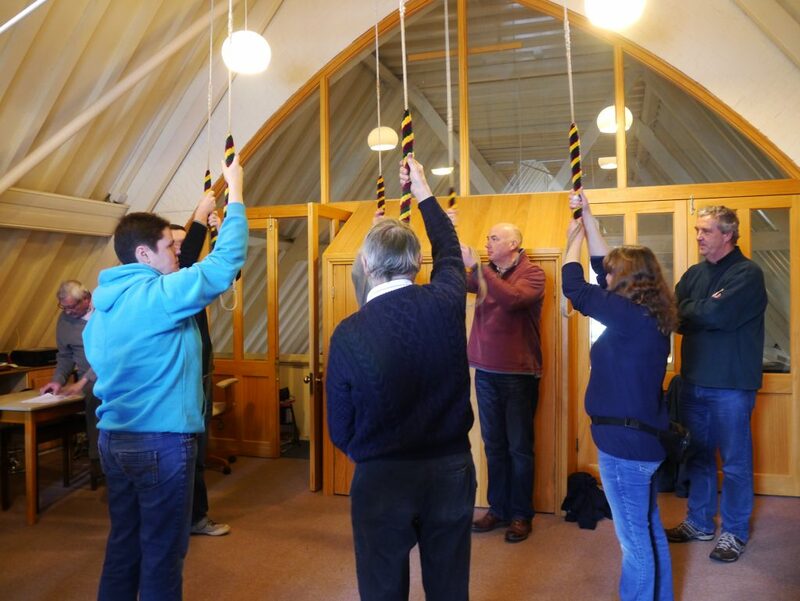 It was a bit of a squeeze with so many people but Dave and Karen made sure that everyone had a ring and personally I think I rang better in the afternoon than the morning – although both towers had 8 bells, 2 more than I have been used to, that is still closer to 6 than 12, so I felt on more familiar ground. The fourth and last church (I was flagging by now!) at Charlton Kings was open and whilst we waited to be let into the tower we were treated to a brief impromptu concert – a male singer plus pianist were rehearsing for a performance. 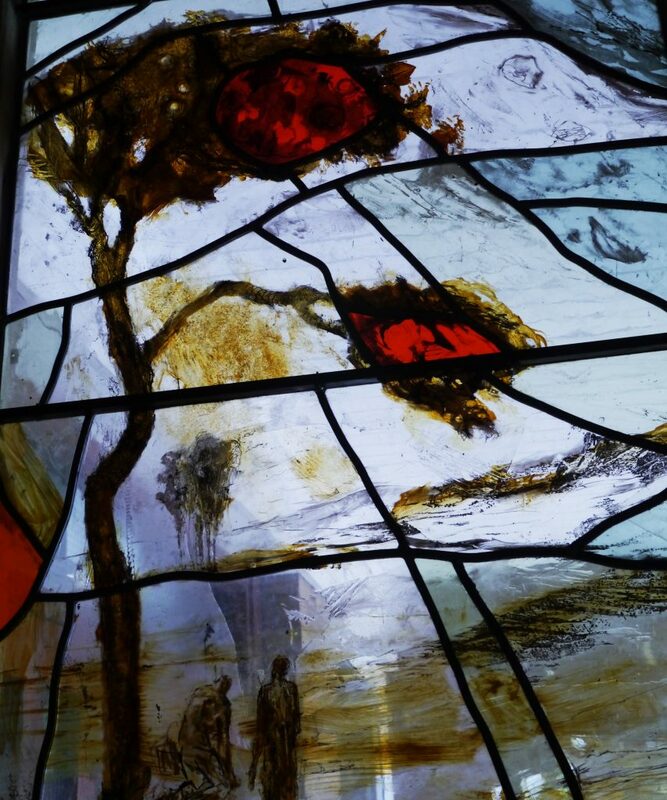 And this church boasted all the traditional features I like to see – wall hangings, statues, stained glass and the like. The bell tower was also traditional – through the little hobbit door and up the winding stone spiral staircase till you’re dizzy! But do you know what? 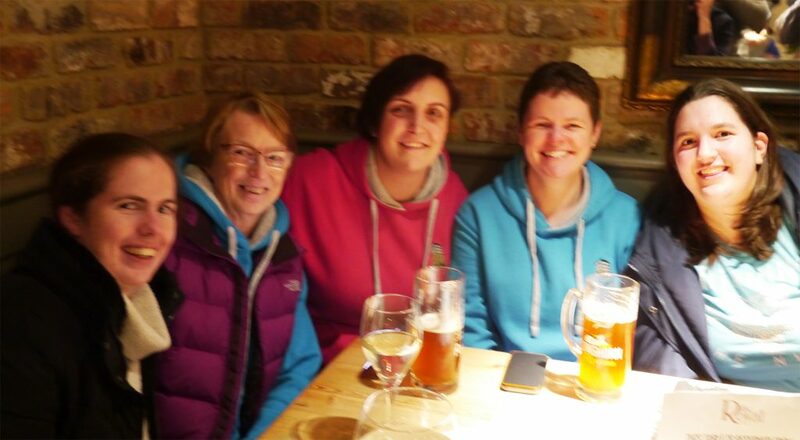 There was another welcome sight – a pub directly opposite the church ! !